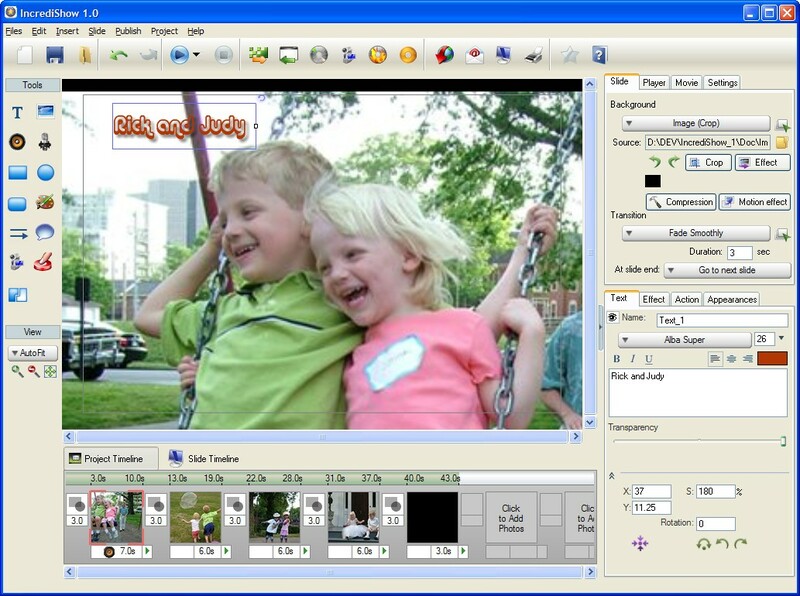 Create professional Flash multimedia slideshow. Blend your photos, Flash movies, music, text animation, videos, built-in clipart. Add Pan and Zoom Motion (Ken & Burn) effect, etc. Add interactivities. Adjust the timing of each object's animation and sound's playback precisely and easily using timeline window. Import MP3/OOG/AVI/WMV/MPEG/GIF animation files. Add and choose playback control. Publish as Flash movies, EXE, DVD/CD. Works on Vista. ...... more. Each effect is highly customizable. An intuitive slide transition selector with a real time preview is provided to easily select the right effect for your need. Add a stylish Pan and Zoom effect to enhance the appearance of your slideshow. You can manually adjust the pan and zoom amount for each slide. Enhance your slideshow with decorative object such as text, callouts and cliparts. You can apply an animation effect to each object. Various shape of callouts and cliparts are bundled with the software. Qweas is providing links to IncrediShow 2.06 as a courtesy, and makes no representations regarding IncrediShow or any other applications or any information related thereto. Any questions, complaints or claims regarding this application IncrediShow 2.06 must be directed to the appropriate software vendor. You may click the publisher link of IncrediShow on the top of this page to get more details about the vendor.